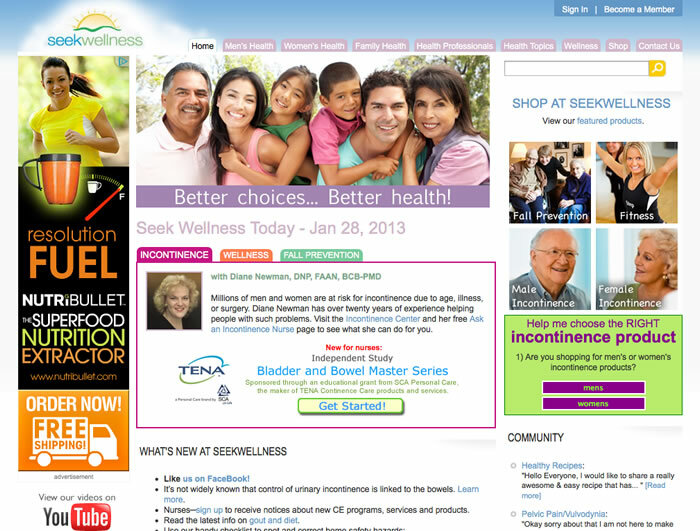 SeekWellness.com is a large scale health information website with a fully customized e-commerce store owned and operated by Wellness Partner LLC. One of our favorite clients, Wellness Partners placed implicit trust in Vikki, as she coded the entire website from beginning to end. Wellness Partners, LLC provided us with a picture of the design they wanted and then asked us to help solve the issue of organizing large amounts of related content without crowing the article pages with dozens of links. We came up with several solutions and then implemented the winning design. A custom CMS that allows the staff to update content and change page layouts and ad placements on a per category and per basis basis. The AJAX driven incontinence products buying guide, which helps customers to find exactly the product they need and offers a convenient way to “buy it now”. Dynamic PDF store catalogs that pulls live information from the store database and places it into a downloadable PDF along with an order form. “Ask a Nurse” web application which allows site visitors to anonymously ask health questions to a registered nurse and receive an email reply. The database of questions is searchable. A completely customized the e-commerce store with a customer loyalty program called “Wellness Dollars”, “You might also like” product recommendations, and more! We created several landing pages for products within the SeekWellness store. You can view all of the landing pages by visiting the featured products page. Each product link is a separate landing page targeted to a particular audience using specific keyword phrases. Every landing page has an obvious call to action (usually a big “buy now” button and enough product information to help a visitor decide if they want to buy the product. “Vikki Peroza has worked for me as a freelance web developer for four years and as an employee since May of 2010 serving in the capacity of Internet Coordinator. During that time, Vikki has completed a wide variety of projects, all of them well done... Vikki has also done interesting projects for some of our clients. One project in particular allowed a client to design a new “skin” for a website that she applied to their existing database, which saved them a great deal of money over creating a new website from scratch. One of Vikki’s best characteristics, however, is that she is very creative with solutions to problems that crop up. No problem seems insurmountable to her and she always seems to find a good workaround. I highly recommend Vikki as a skilled web developer, problem solver and competent worker.” — Lenore Howe, Wellness Partners, LLC.